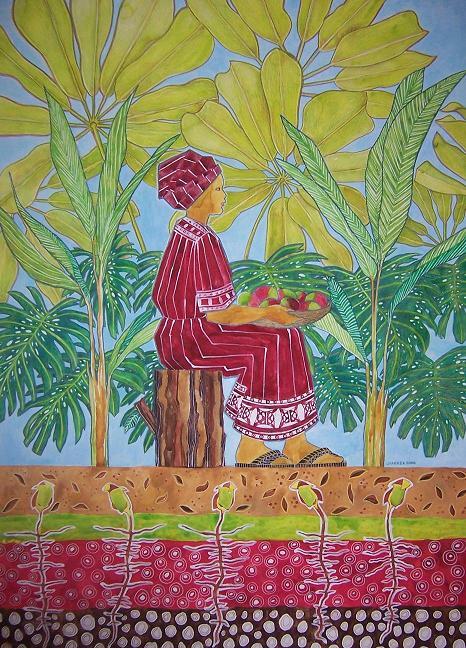 Louise Parker is a talented South African painter incorporating African designs, colors, and themes with gospel stories and characters. She recently moved from Port Elizabeth, a small coastal town, to Johannesburg. 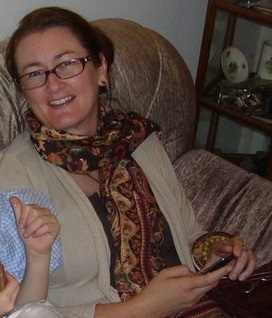 She and her husband have three daughters. Her painting African Proverb VI (Iron Rod), shown above, and others below display that marriage between the gospel and her native land. Parker: The Widow’s Mite (below): The idea for this painting formulated just before conference and I was surprised during conference to hear a talk about the widow’s mite, so this painting felt as though it really needed to be out there. 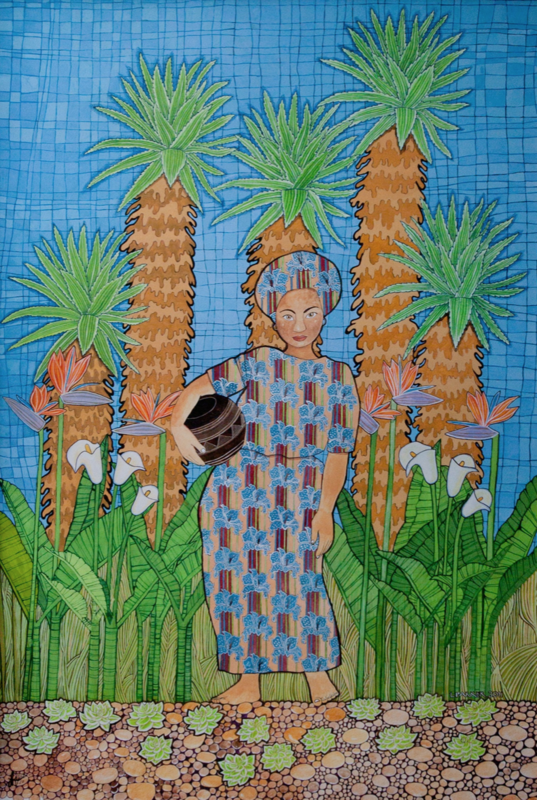 Parker: African Proverb I (below): One of the first paintings I produced inspired by African women. Parker: Price Above Rubies (below): In the eastern cape where I am originally from, the climate is harsh and the plants that grow there are hardy and not always pretty, I felt this was a perfect analogy for many good people who serve diligently and survive harsh conditions, and these wonderful people are worth more than rubies. Parker: Blessings (below): This painting was all about how we fall into the trap of comparing ourselves to others. 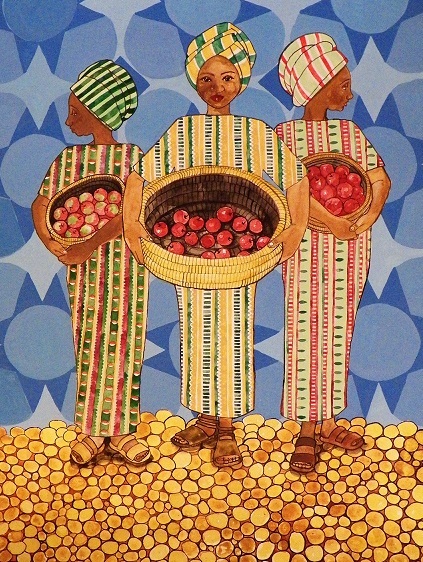 The three ladies have the same amount of apples, but because the middle figure’s basket is so huge, it looks as though she hasn’t got an equal portion. We make all sorts of assumptions when we compare ourselves to others – mostly incorrect and that’s the message I wanted to share in this work. How did you join the church? I was 17 years old and felt a desire to join a religion. I felt dissatisfied with the religion I had grown up with and began to investigate different religions as a matter of interest with my Jewish friend. I had known a Mormon girl at school and I had admired her parent’s marriage and relationship. I felt that I wanted that type of marriage. After having the missionary discussions, I became a member of the church just before my 18th birthday. Describe your art career. I studied art at Nelson Mandela Metropole University, majoring in fine art. I participated in various local and regional exhibitions and taught art lessons. Around 2000 I began illustrating for Macmillan Publishers. 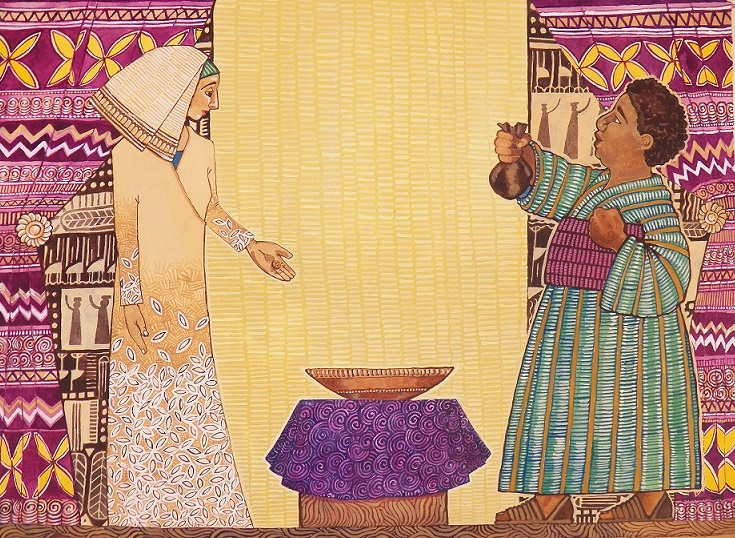 I had never considered producing religious artwork – in 2006 I sat in a rebroadcast of conference and heard a talk by Sister Anne Pingree. She spoke about her husband giving temple recommend interviews to Relief Society sisters who walked for miles to attend the interviews. Long after they had completed the interviews, Sister Pingree and her husband were making their long drive back and saw these two faithful sisters walking back to their village carrying temple recommends that they would never use. As Sister Pingree spoke, I began to draw a figure, holding her temple recommend close to her heart. As I went home, that Saturday night I began to plan the painting. 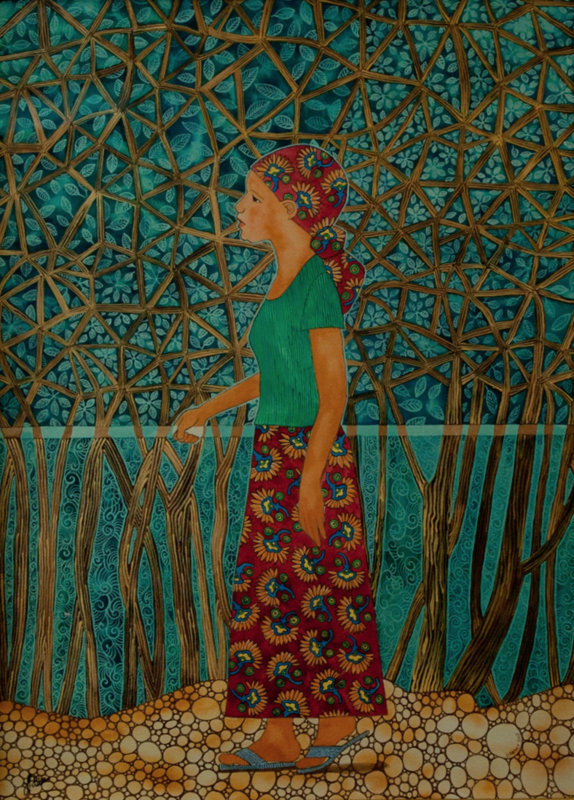 The parable of the five wise virgins came to my mind and I began painting the following week. It was one of the most extraordinary and blessed experiences I have ever had. Work on the painting went very quickly and in spite of the detail, I completed the work in a few weeks–I had a day job at the time. I sent the painting in to the church worldwide art competition and was blessed with a purchase award. The painting was used to promote the art competition on the website and published in the Ensign. At around the same time, we had some families move into our ward from Zimbabwe and I became close friends with one of the sisters. She shared some stories about what they suffered and endured in Zimbabwe and ideas began to develop. I began to think of the scripture in Proverbs: who can find a virtuous woman? And it just seemed fitting to produce a series of paintings paying tribute not just to South African women who are industrious and brilliant examples, but also Zimbabwean and other African sisters. These sisters are so warm and kind and happy in spite of harrowing circumstances. I began to produce vibrant colourful patterned works to try and portray this. I don’t think I’ll ever quite portray the brilliant nature of my sisters, but I will continue to be inspired by their marvelous stories. What has been the reception to your artwork? The reception to my work has been astounding – I have received emails from members who have shared experiences of how certain paintings moved them or made them feel the spirit and this is such a humbling experience for me. The success of these paintings has been limited to America and Europe. Religious themed artwork does not seem to be a popular in South Africa – especially not for an unknown artist. What’s your next project? I have a large project that I am very excited to start. When we were still in Port Elizabeth, a member of our stake presidency spoke to me about an idea he had for a painting. President Wildskut was raised in the Cape and when the men went out to fish and they would return home in the dark, the women would stand on the shore and hold lanterns, open the doors of their cottages to let the lights shine and they would stand and sing to the men to guide them home. The men, in turn would sing to the women as they neared the shore. He suggested the title Lead Kindly Light. I would like to do this painting on a large scale on canvas so I’ve been experimenting with acrylics and canvas.